Today I packed up a ton of swag for this weekend's Edmonton Expo. We're bringing a record ten shirt designs with us this year, along with all my books and some copies of the Waterlogged anthology Shannon and I contributed to. And of course, I'll be doing a bunch of original drawings and commissions as well -- so there should be plenty of cool stuff to choose from! Today I also took a stab at The Wonderful 101. At no point did I have the slightest idea what was going on or what I was doing. But I really like the concept, which is sort of like Pikmin with Power Rangers. Everyone says the game starts to click once you've played it for a bit... I'm not sure how long it'll be before I have time to hit that threshold, but we'll see how it goes! In the meantime, team, enjoy today's comic. And see you on Wednesday for the next one! Rose City Comic-Con this weekend! If you are in Portland this Saturday or Sunday, you gotta come to Rose City Comic-Con! I will be at booth 802 with Aaron Diaz and Tyson Hesse, signing stuff and drawing dumb pictures. 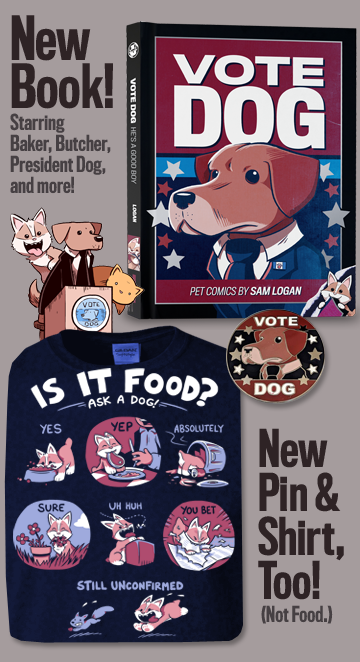 And of course, there will be plenty of swag from all three of our comics on sale there, as well. It should be fun! Traditionally, the New Reader section has suggested starting at the beginning of the current major multi-year story arc. In the past, it pointed to the start of Noosehead. Since that arc wrapped, it's pointed to the start of Fix Your Problem. The current arc is my longest yet -- we're in the middle of volume 4 of it right now, and there is still a ways to go! 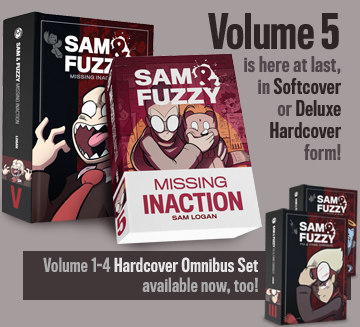 I still think Fix Your Problem is the most logical place to start reading it, but I wrote the beginning of the current Volume, Sam and Fuzzy Ruined Everything, as another potential entry point for new readers, and may update the new reader page to reflect that option at some point. I swear, it's still coming. Really! The visual design is done, but there's some new back-end stuff as well, and that's still being finished up. But we're getting there!